Diane, thank you for your honest review of this audiobook. I've seen this author's name (probably here) but have not read (or listened to) her work yet. Since you listen to so many audiobooks, I hope you'll stop by my blog because I have a special guest post about audiobooks. I've only read one of her books but it's been a long while. Not sure about this one but would actually like to check out her series. It almost doesn't sound worthy of your 3/5 rating! Thanks for sharing your thoughts, I'll pass on this one. Too bad this one didn't work out, it sounds like it could have been interesting. Sorry this didn't work out for you. 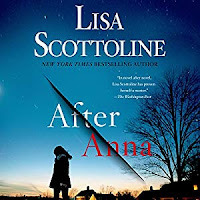 For some reason I have not ever read Lisa Scottoline. You must have read earlier books of hers and hoped for better with this one. I read one of Scottoline thrillers early in my reading-in-English life (late 90s to early 2000s). I liked that thriller very much, but I haven't read anything else by her. It sounds that this one wasn't entirely successful with the twist she pulled.